I turn to these colors over and over, especially when I'm doing flowers. I'm so glad I bought it! 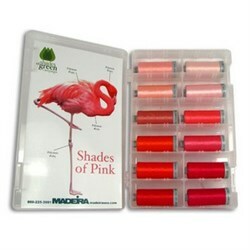 This awesome kit contains 12 pre-selected solid colors of Madeira''s popular polyneon 40wt, thread. Each spool contains 1100 yards of shades of pink thread and is perfect for any project.